Last May, Alvaro and I spent a week playing tourists in New York City. 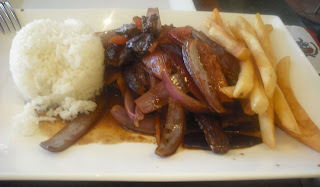 Before arriving, we did our research and found a Peruvian restaurant in the West Village. 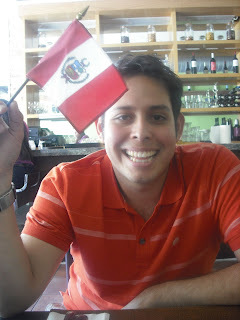 After spending the morning at the UN (and buying the flag you see here) we went to Panca for the closest thing to authentic Peruvian food available in the US. Of course, I thought everything was delicious, the true test was whether or not Alvaro's more particular palette would approve of ceviche in the city. And it did, he loved it. We dined on causa, ceviche, lomo saltado and tres leches. We sipped on pisco sours and Cusqueña. All in all it was a success. Recently, Panca earned a food score of 23 on Zagat. This is the highest score a Peruvian restaurant in Manhattan has ever received. Believe me, it's well deserved. Congrats, Panca! If you or someone you know is going to NYC, send them to Panca. There's a reason Peruvians are so proud of their food. 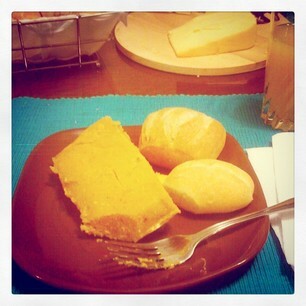 Now almost seven months into my new life in Lima, the one thing that I simply can not adjust to is eating a big lunch. I can't do it. I have tried and tired and tired. It's customary to eat a large lunch (think American dinner) anywhere from 1-3pm and then to have a light dinner later in the evening sometime around 9pm. The first few months that I was here, I tried to eat large lunches with Alvaro's family. Big meals consisting of meat, veggies and rice or potatoes (but sometimes rice and potatoes) were put in front of me. I was polite and grateful for my new hosts, so I ate. Even though I had a huge lunch, when 7pm rolled around a little voice in my head said, "Ok, Meghan, time for dinner." When I started my new job a month ago, the first question Alvaro's mom asked me was "What will you be eating for lunch?" I told her that the school offered lunch for all the teachers and she exclaimed that this was, "So wonderful! That's fantastic! You need to eat those big lunches because you are going to be working a lot now and certainly need your strength." I neglected to tell her that I wasn't planning on eating those lunches, but instead was planning on bringing my own food. The thing is, when lunch rolls around, I crave a salad or fruit and a sandwich. Not a plate full of meat and rice. Nearly every time I see Alvaro's mom or aunts, the conversation somehow leads to my nutritional intake and what kinds of food I am eating and when. On a few occasions, when asked what I had for the meal in question, I have told the truth and been bombarded by four very concerned women fawning over my health. It's an interesting cultural moment because I can't remember the last time my parents were so interested in the details of my diet. I moved into the college dorm when I was 18 and from that moment on, I was solely responsible for my own nutrition. When I wasn't eating in the university cafeteria, I was cooking my own meals. Admittedly, they were not always the healthiest, but when you live in a dorm with only a microwave as stove, you make some sacrifices. I ate one too many helpings of EasyMac, but I"m around to talk about it so I wasn't harmed too much. Believe it or not, I can feed myself. In Lima, most children live at home until they are married. The average age for marriage seems to be closer to 30, not in the early 20s like most of my university peers back home. Because of this, parents are more intimately involved in their children's care and nutrition for much longer. I value this and appreciate the family ties it helps to create. However, there's a small part of my independent American self that struggles to fit into this mold. I have found that my solution is to simply smile and agree. I tell his mom and aunts that somedays I eat at school, even though those days haven't come yet. I reassure them that I am taking my vitamins and eating my protein, all while remembering to drink milk with breakfast. I am doing my best to let them take care of me, while still holding onto me. Before moving to Peru, I had only had tamales at Mexican restaurants. These delicious bundles of chicken and ooey, gooey queso were my image of what a tamale should be. They were served with rice and/or beans and maybe a small salad. I moved to Lima and found a completely different variety of tamales. 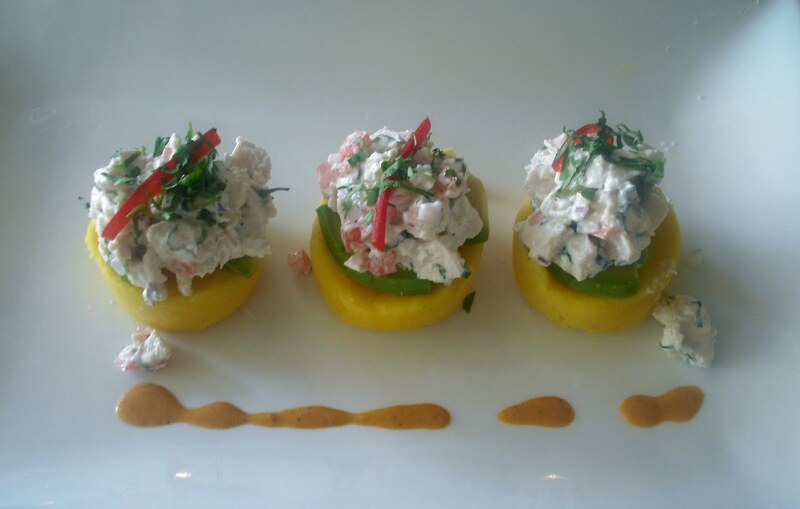 Peruvians carry an amazing sense of pride in this dish, which can be eaten any time of day. I have become somewhat addicted to a Saturday morning breakfast consisting of a warm tamale, fresh bread, gouda cheese and homemade juice. My previous American addiction to pancakes with peanut butter is now long forgotten. Peruvian tamales are made using a corn based dough and usually are stuffed with chicken or pork, olives, peanuts and of course, Peru's beloved aji pepper (super spicy, watch out for that one). There's another similar food called humitas which are close to tamales, but foreigners be aware, Peruvians are serious about the distinction. Humitas are prepared with fresh corn, lard, salt and an ample amount of queso fresco (a creamy, unaged cheese common in LatinAmerican countries). The texture and taste varies slightly between the two but I am just as happy to eat either one. Mm, so good. And how many days until Saturday? I am working on my Spanish, one day at a time. I studied Spanish in high school but to be honest, never put in that extra effort that is need to really learn a language. I studied vocabulary and did well on my tests, but I never attempted to actually use the language. Most of my life in Lima is still in English. My relationship is in English, I teach English at a language institute and I work in a bilingual private school. It's possible to go through my day speaking minimal Spanish. My children at school speak to me in Spanish and I reply in English. It's my job to reply in English, which is a nice little shield from their overly critical ears. Last week, one very sweet boy came up to me and asked, "Miss, what time is it?" to which I replied (in English) "It's 8:40." Unsure that he understood correctly, he looked up at me and repeated the time in Spanish, "Ocho y cuarenta?" "Yes," I said, "ocho y cuarenta." A huge smile came across his face, he turned to his friends and said through a giggle laced with a slight accent: "Ocho y cuarenta." The next morning, we were lining up to go to our first activity of the day and this little boy was first in line. His round face looked up at me and he flashed an adorable smile, showing the gap where his two front teeth should be. His face lit up while he said, "Good morning, Miss. Ocho y cuarenta." It seems that this sweet boy can't remember to take home his lunchbox but he can remember my American accent on "ocho y cuarenta." In less than three weeks, Peru will face the second round of their Presidential elections and be forced to choose between two rather unappealing candidates. The first round of elections were held on April 10th. The greatest percentage of votes were split between the top five candidates and now the country is moving to a second round in June. The two remaining candidates are Ollanta Humala and Keiko Fujimori. As the election results came in on April 10th, Alvaro kept telling me, "This is the worst possible outcome for the second round. We are now choosing between bad and worse." News sources from around the world were commenting on the difficult choice ahead for Peruvians. 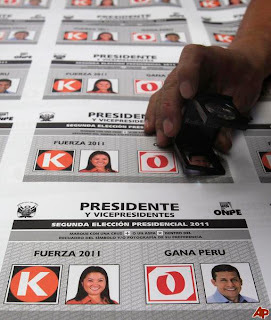 Ollanta Humala ran for President in 2006 but lost to now President Alan Garcia. He's a former military man with no government experience and connections to Hugo Chavez. He's popular in the poor provinces of Peru because he represents a radical change. His main platform is that though Peru has experienced significant economic growth in the past several years, the boom hasn't reached the provinces. He is promising to channel economic growth to the outskirts of Peru. This is a worthy and just platform, but the rest of his government plan includes, among other things, the nationalization of all banking and retirement accounts and putting a stop to Peru's exports. Keiko Fujimori is the daughter of former President Alberto Fujimori. Alberto took over the country in 1990 when Peru was being tormented by a terrorist group and battered by massive inflation. In his term he was able to calm inflation, introduce a new currency and put an end to the terrorism. But his presidency wasn't without scandal. He also forcefully changed the Constitution and is currently serving 25 years in prison on charges of human rights violations. Fujimori didn't personally commit these crimes, but rather a separate group of government employees were found responsible. Peruvian opinions of Fujimori fall into one of two extremes. Those who praise his accomplishments and believe he had no knowledge of the crimes and those who claim that as President, there is no way he could have not been aware of what was happening in his cabinet. It's making for interesting political debates as Peruvians from every background, struggle to choose their next leader. There are those who have chosen to strongly back one candidate, however, most of those that I have talked to have decided to simply choose, "the one that's not as bad". This enthusiastic yell of "Dude, dude!!" can be heard throughout the streets just a few blocks from my apartment. Though this call occurs in all of Lima, there is an interesting concentration of it covering four square blocks in the nearby area. As a car turns the corner, the man and/or woman standing on the sidewalk yells out, "Chamo, chamo!!" to tell the driver of the car, that they are ready for a transaction. Should you desire, you can pull over the car and sell just about anything you want. Clothes, shoes, household goods, linens; you have it, they buy it. Easy as that. Alvaro tells me that most sellers in this situation are individuals looking for easy cash and fast. You can only imagine why they would need that money. But through some sort of necessity, the chamos have arisen. My favorite part is how these small transactions have influenced the Spanish language. Chamo went from slang meaning "dude"
to a noun meaning: "the person who buys stuff on the side of the street"
to the verb chamear meaning: "to sell random stuff on the side of the street"
Ah, yes, the glorious transformation of a language. Check out this future stuntman that we found in the produce section of the supermarket last weekend. Don't miss the bag of lettuce that he is holding in his right hand. This is right about the moment that his mom sent him to get ten tomatoes. And of course, instead of leaving the bike in the corner, he took a spin past the potatoes and carrots before arriving at his destination. When I was younger, I begged my mom to take the fancy carts with a plastic car attached to the front. Despite my constant begging, she never gave in, saying that the cart was too big and too difficult to maneuver. We only used the regular, mundane, kid-not-approved carts. And this kid gets to ride his motorized, plastic motorcycle into the supermarket. Best Mom of the Year Award. Oh, and to my mom: Now that I'm not seven anymore, I realize that you were right about the cart thing. I no longer feel deprived of my childhood. One thing that Peruvians do really, really well is packaging. Call me crazy for noticing the efficient containers and pretty presentations, but when you're searching for positives, even packaging makes the list. 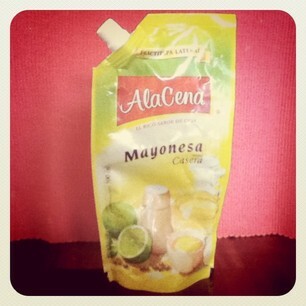 I wish that I would have thought of packaging mayo like this. It's much simpler and requires less utensils, a win-win situation when you don't have a dishwasher. I hate that moment when you get to the bottom of the mayo jar and fight with your knife and/or spoon to get the last, stubborn bits at the bottom of the jar. This problem is non-exsistent with Peru's ultra handy package. Most likely, there is still some mayo left when the bag appears to be empty, but at least I don't have to see it. Winter has finally arrived in Lima. And thank goodness for that. Since I hopped continents last November, I have been in a perpetual state of summer since Nashville's unseasonably warm spring last May. This winter loving girl is ready for a change. I grew up in South Florida and therefore didn't experience my first real winter until I was sixteen. And I love it. I enjoy summer for the warm days and crisp sunshine, but I only really like summer if I am poolside with a cool drink in hand. I don't want to sweat the minute I walk out the door and unfortunately, that's a big part of summer. Besides the sweating issue, I simply prefer my winter wardrobe. When I bought my first pair of boots at eighteen, I think my world changed forever. During college, I worked retail and my coworkers used to make fun of me for my "winter uniform". Most everyday during the winter, I wear some combination of a dress, tights, boots and a scarf. It never fails. When I put on my riding boots for the first time this season, I felt unstoppable. I walked to work with a new air of confidence, a new swagger (can I have that?). I felt like no one could mess with me. When I am wearing my boots I know that if a cowardly Peruvian man were to whistle, kiss or call my way that my boots could do some serious damage. Finally, my winter in May has arrived and not a moment too soon. Does this mean that it is now acceptable to celebrate Christmas in July? In addition to the ever intriguing cheek kiss, there appears to be even more complications with the greeting culture in Peru. Two weeks ago, I was sitting in another teacher's classroom when her teenage daughter walked in. I was reading a magazine and the girl rushed over to her mom and began to animately describe her day. Her mom stopped her mid sentence and said, "Greet Miss Meghan." The girl rushed over to me and greeted me with a kiss. Last week, I walked into work at 6:35am, greeted the secretary and rushed over to read the schedule. I was struggling to carry all of my books, dreading teaching so early in the morning and intently looking at the schedule. Within a few seconds, the cleaning lady waved her hand in front of me and said, "Hooolllllaaaa, Meghan. How are you?" with a slight twinge of frustration in her voice. It wasn't until much later that I realized that she was offended that I hadn't greeted her. A similar encounter like this has played out twice the same woman. In several instances, when Alvaro and I have rushed into his house or been working intently and not greeted someone individually, we have been on the receiving end of a correctional conversation with his mom. I finally asked him about this and he said that without a doubt, if you do not greet every single person in the room and/or house, you have just offended all who are present. It's an interesting cultural note because I am not used to such formalized greetings, especially in everyday settings with individuals I do not know very well. Though it's sightly uncomfortable, I think that my discomfort speaks to the individualized American in me that has been cultured for the past twenty three years. What cultural differences have you encountered when it comes to greetings? Sir, I'm not a tourist. A few days ago, I was playing tour guide to a young American woman spending a week in Lima. We had spent the morning getting pedicures, eating a Peruvian lunch and our final stop was the Incan Market. This is by far the best place in Lima to find hand crafted goods from all over the country. We spent several hours exploring the booths and finally made our way home. I hailed a cab and quickly asked the driver to take us to a roundabout that was approximately half way between our two apartments. He quoted me a price of S./5 which seemed reasonable. We hopped in and as we were driving I realized that instead of going to the roundabout, the driver could continue straight and drop off my friend right at her apartment. I became flustered, so my Spanish was a little rocky, but he understood. When she exited the taxi, I asked him to take me to my apartment. We made small talk on the drive and as we neared my apartment I asked him for the new price, including the ride to my apartment. I've been here long enough to have a good idea about what the price should be. I also know enough about Peruvian taxis to know that I should have settled on the multi-destination price before I got into the taxi, but I'm making slow progress with these things and can't expect too much. He immediately quoted me the price "S./12". "I am not a tourist, I know what the price should be." "Well, I'm already in and can't fight too much." "Eh, it's worth a shot..."
I replied very firmly, "10 soles". He looked into the rearview mirror and gave a small smile, realizing that he couldn't pull a tourist scam on me. "Yes, señorita, 10 soles." And, success! It's not even about the two soles, which is roughly 60 cents. It's more so about making it known that I am in fact, a Peruvian in training and I won't fall for their tricks. I am now on Bloglovin'- follow me! This video has become an instant sensation in Peru since its release last week. It is a promotional video sponsored by the new Marca Peru campaign that is seeking to promote a true and modern Peru and boosts Peru's international appeal. The video is full of small tidbits of Peruvian food and culture. My Peruvian friends have said that they have started to cry while watching the video because it makes them so proud to be Peruvian. Enjoy! Living in Peru » Business : Peru finally has a country brand.